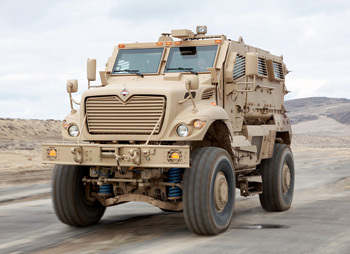 Navistar Defense received a delivery order for up to $282 million to provide more than 2,300 survivability upgrade retrofit kits for International MaxxPro Dash mine resistant ambush protected (MRAP) vehicles. The order from the US Army TACOM Life Cycle Management Command will upgrade MaxxPro Dash vehicles in theatre with additional protection in response to evolving threats in Afghanistan. The order also includes parts and service. The MaxxPro family of vehicles was originally designed to accommodate rapid vehicle enhancements as threats evolved in theatre. Since 2007, the company has provided enhancements to both survivability and mobility through its work on its rolling chassis body swap, DXM independent suspension retrofit kits, armour kits and more. Work for the survivability upgrade will be done in Afghanistan beginning in December 2012. The order is scheduled to be completed by July 2013.